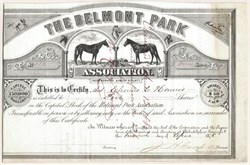 Beautiful certificate from the Belmont Park Association issued in 1878. This historic document was printed by J. H. Camp - Philadelphia and has an ornate border around it with a vignette of horses facing each other. This item has the signatures of the Company’s President and Secretary, and is over 138 years old. Just behind the General Wayne Inn and across Meetinghouse Lane William McDowell sold seventy one acres in 1876 to the Belmont Driving Park Association for harness racing, then the most popular sport in America. An oval course eighty feet wide and one mile in length was laid out; later a half-mile track was built inside the larger course. The association built a frame grandstand and later added a four-story clubhouse with tower, cupola, and two long verandas overlooking the track. 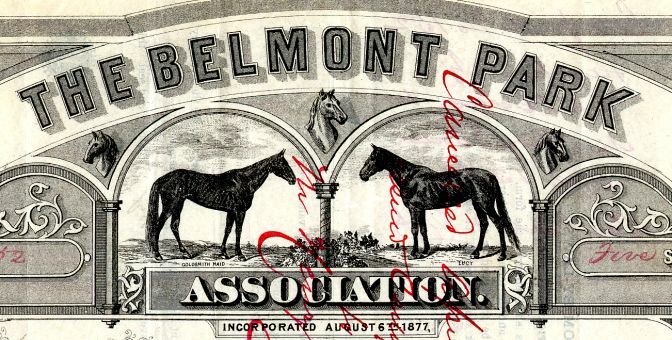 The culminating event in the nearly fifty years of the Belmont’s history was the Grand Circuit of 1917, then as prestigious as the Kentucky Derby. In 1924 the park was sold to Martin Maloney, who developed it into 347 building lots in the section called Merion Park. The Belmont Driving Park A mile-long oval race track for harness racing was created in 1876 on land where Washington and his troops, after crossing the Schuylkill, had camped on September 13, 1777 on a site called Price’s Field.